TransLink cardholders, ever wondered why the BART gates are slow in responding to TL cards while others who use the EZ Rider card are getting speedy access? TransLink admits: "TransLink processing time meets the contractual fare gate throughput requirement of 30 customers per minute. 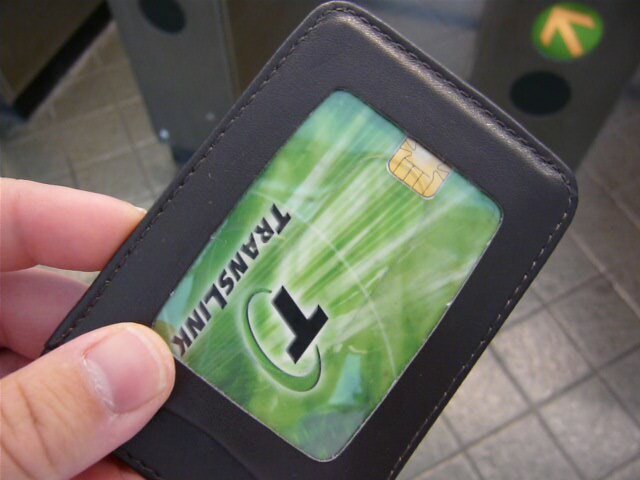 However, the TransLink processing time is 3 times longer than the EZ Rider card, due to differences in the software architecture between the two card types..."
TransLink's suggested solution is to increase the power of the proximity sensor and it requires modifying the card readers. You may notice the new white card readers (photo sample from Twitter user) at places like Daly City and Embarcadero. The conversion and power increase is so the card readers are "more forgiving when a customer makes a less than ideal tag." They plan to complete this conversion within several months. TransLink is also modifying the software in the BART gates so the processing time is reduced. This means a quicker tag of the card to gain entry to the system. Modifications started in February, another update in July, and final updates by September. Things are looking brighter for TransLink. I hope these improvements will help. Great! I wish Muni would do the same thing. Tagging on Muni is an exercise of HOLDING the card up against the reader for an annoying amount of time. It'd be nice if you could just swipe it on by instead. By the end of the year, the Muni faregates will be replaced. Hopefully that'll do the fix.